Free! 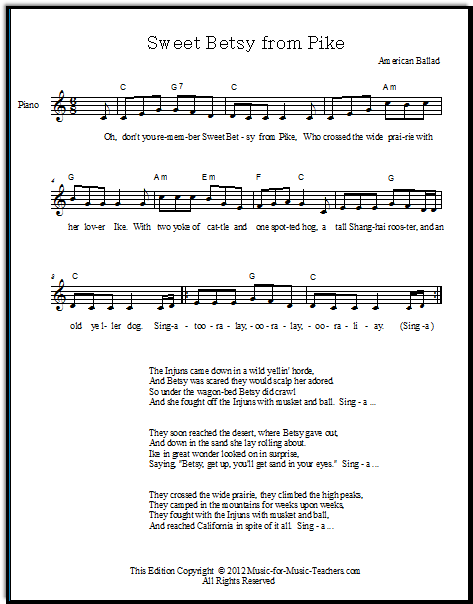 Lead Piano Sheet "Sweet Betsy from Pike"
Free lead piano sheet "Sweet Betsy from Pike" in the key of C. This old-time American ballad seems to remain a favorite with young children; here is a version with many verses! 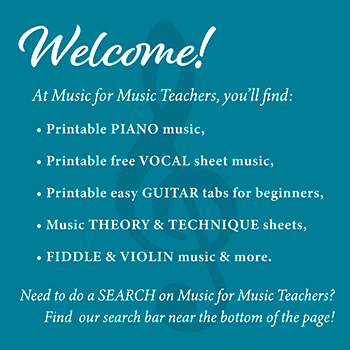 Take a look at the bottom of the "Lead Sheets" page for ideas on how to introduce lead sheets to your students. This particular melody is beyond all but the most dedicated beginner to master with the right hand alone, so by the time your student is ready for adapting this song, they should have mastered several kinds of left-hand chord patterns. With this free lead piano sheet in 3 beats a measure, the "Oom-pah-pah" or split chord approach works well.